Radio Sidewinder is an independent media organisation that broadcasts music, news and gossip to Commanders across the Galaxy 24/7. Yes, we are a real radio station! Head over to https://www.radiosidewinder.com/ to find out more about our signal. Based around our radio station, we have an active Discord server, where we welcome all commanders for a friendly chat in our Pilots Lounge. We have a wide range of commanders in channel from all different timezones and different platforms, help and assistance is always offered. Our members are actively engaged in the promotion of free speech and great tunes.... because music unites the Universe and information is power. 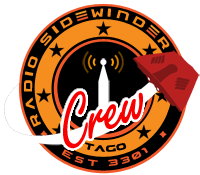 The Radio Sidewinder Crew is a player faction, based in the Tago system and spreading our influence over the region. In Colonia, Radio Sidewinder Galactic maintains Signalis and upholds the Colonia Accords. Many commanders are present in Open Play, but we also have our own private groups as well as people in Solo. Commanders who wish to fly with us and expand the influence and ideals of this organisation should sign up to become a member of the Radio Sidewinder Crew. Start by joining our Discord, then follow up with an application here on Inara. Members of the Crew are also welcome to join the new in-game Squadrons. Not belong to another in-game Faction (formerly known as minor faction). Having Powerplay allegiance to a Power is fine. Come and talk to us on Discord! If we don't get to know you, we probably won't let you in! Where possible, please link your Inara account to your Frontier account, so we can verify your in-game name. Write a decent application, about 100 words is ideal. Include your Discord and in-game commander name. Tell us what you like doing or want to learn. Be patient - don't just turn up once and expect us to say yes straight away! Good things take time, and the Crew is run by commanders who volunteer their time to help out. Entry into the Crew is subject to veto of a Ranger or higher. The use of hacks is not permitted. Anyone caught cheating will be dismissed from the faction and ejected out the nearest airlock... without a suit ... or a radio. We don't demand playing in Open or engaging in PvP, but if you are in Open please be aware of the dangers - and the opportunities! Radio Sidewinder - Guiding and entertaining commanders across the universe. Radio Sidewinder broadcasts a 24/7 mix of ambient, electro, techno and space themed music to complement and entertain your adventures. We include Elite Dangerous related news, jingles, ads and in-game information. Listen in now at www.radiosidewinder.com.